Warden of Convocation, Doug McGhie, completed the Ride to Conquer Cancer on the weekend of October 13th and 14th, managing the 200 kilometres well if not all easily. Warden of Convocation Doug McGhie successfully completed the Ride to Conquer Cancer in early October. Each day saw the 800 plus cyclists pedalling into stiff sea breezes, and on Sunday into 70 km/h headwinds along the Warnbro Sound coast. The Saturday evening in Mandurah was special as the head of the Harry Perkins Institute, Professor Peter Leedman, introduced top fundraisers and some particularly brave and inspirational cyclists, some of who were completing the challenge for their seventh time. Doug supported the three causes that are close to him: the Perkins with its cancer research, motor neurone disease research at UWA and the new UWA Young Lives Matter Foundation, supporting youth mental health. 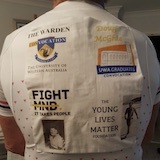 Throughout the ride he wore his specially made jersey (pictured) that carried a picture of his mother, lost to Motor Neurone Disease, and his son who was lost to suicide fifteen years ago. He has chosen research by Professor Nigel Laing as the supported project for Motor Neurone Disease research. Nigel is working in a nation-wide consortium to obtain and analyse DNA samples from patients in Australia who have sporadic MND. This is the Australian part of an international research project to try to find if there are genetic susceptibilities to sporadic MND. Nigel's group aims to obtain a DNA sample from every sporadic MND patient in WA or as near every patient as we can manage. Doug was able to raise about $7,500 in total, not as much as hoped but a worthwhile amount. The weekend total for the ride was over $4.1 million, a great result for a great ride. Well done the Perkins.